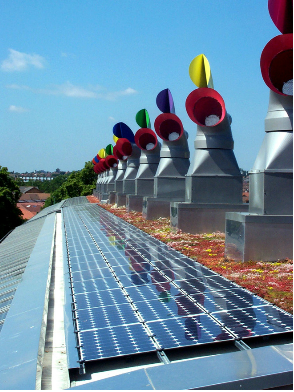 The Beddington Zero Energy Development, or BedZED for short, is the UK’s largest carbon neutral development. It provides 82 residential homes with a mixture of tenures and sizes. The project also includes buildings for commercial use, an exhibition centre, a children's nursery and a show flat so that visitors may see what it is like to live at BedZED. Buildings are constructed from thermally massive materials that store heat during warm conditions and release heat at cooler times. In addition, all buildings are enclosed in a 300mm insulation jacket. 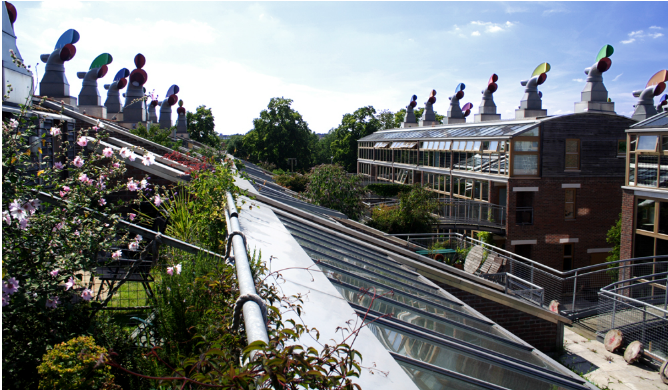 BedZED houses are arranged in south facing terraces to maximise heat gain from the sun, known as passive solar gain. Each terrace is backed by north facing offices, where minimal solar gain reduces the tendency to overheat and the need for energy hungry air conditioning. Where possible, BedZED was built from natural, recycled or reclaimed materials. All the wood used has been approved by the Forest Stewardship Council or comparable organisations. BedZED homes and offices are fitted with low energy lighting and energy efficient appliances to reduce electricity requirements. Visible meters are mounted in homes and offices so the occupiers can keep tabs on their electricity consumption. BedZED receives power from a small-scale combined heat and power plant (CHP). In conventional energy generation, the heat that is produced as a by-product of generating electricity is lost. With CHP technology, this heat can be harnessed and put to use. At BedZED, the heat from the CHP provides hot water, which is distributed around the site via a district heating system of super-insulated pipes. The CHP plant is powered by off-cuts from tree surgery waste that would otherwise go to landfill. Should residents or workers require a heating boost, each home or office has a domestic hot water tank that doubles as a radiator. Making the roof areas green with sedum plants helps increase the site’s ecological value and its carbon absorbing ability, as well as giving the occupants private gardens. Next to the green roofs are the photovoltaic panels to generate electricity. Transport energy accounts for a large proportion of the energy consumption of any development. A green transport plan promotes walking, cycling and use of public transport. A car pool for residents has been established. BedZED has good public transport links, including two railway stations, two bus routes and a tramlink. On-site charging points for electric cars and a free public electric vehicle charging point is already available in Sutton town centre. BedZED's 10-year target is to produce enough electricity from photovoltaic panels (which convert sunlight into energy) to power 40 electric vehicles. It is hoped that a mixture of private cars and vehicles available through the car club will minimise fossil fuel use as the community settles. For owners of electric vehicles energy and parking will be free of charge. Yes its very hard to find knowledgeable people of particular field.